It’s interesting when a film comes out accompanied by the words ‘performance of [insert actor of the moment here]’s career’, it changes things. Going in we consequently expect to see a deeply layered and nuanced look at Turing’s life (and Cumberbatch makes every effort to provide this), but this is a film which ultimately shies away from examining the complexities of Turing’s situation. The Imitation Game is certainly entertaining and somewhat moving, but it’s the actors here who are responsible for doing most of the heavy lifting as they build a fairly average script into something that’s far better than it really ought to be. Benedict Cumberbatch is undoubtedly the shining light at the centre of this film. He may have taken on more than his fair share of eccentric and socially inept geniuses by now, but he takes carefully considered steps to distinguish this performance from his past similar characters. Here he uses up every last drop of depth from a somewhat lacking script to conjure up a very committed and intelligent performance; he’s suitably complex and intriguing as Turing, whilst managing to keep the character grounded in emotion and humanity. I don’t think this is the performance of his career as many have been saying, but that’s down to the script’s limitations rather than the effort and thought which he has put into the role. Cumberbatch’s costars all put in really good work here too, with Knightley and Strong being highlights. But no matter how much good the cast do they can’t cover up the fact that this film is a little thin on the ground in places. 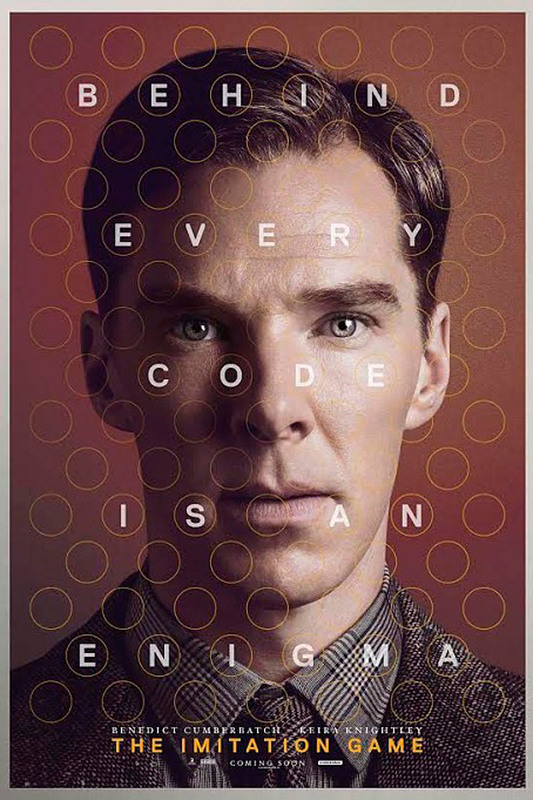 It functions well enough as a thriller, although the framing device and the time jumps are a little clunky at times, but it neither lets us in on some of the complexities regarding solving Enigma, nor does it tackle Turing’s sexuality and his unjust punishment in much depth at all. 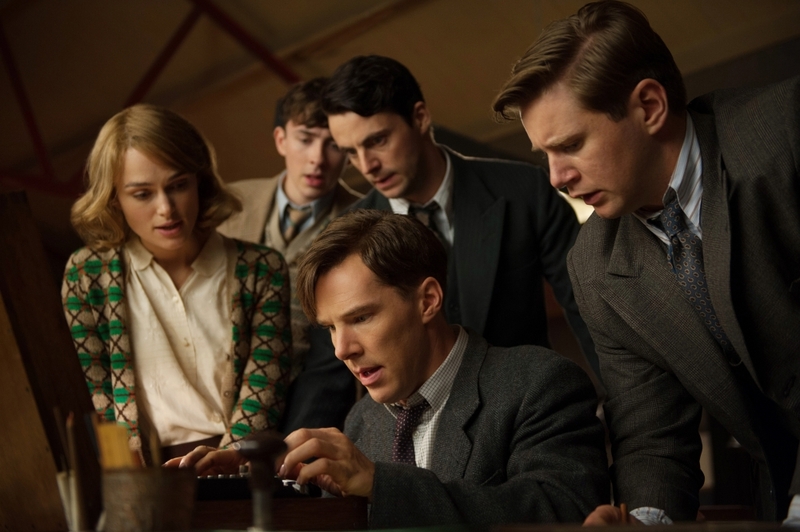 Regarding the process behind cracking Enigma I can appreciate that few people, myself included, would want to see a version of this movie where we are hit over the head with technical know-how, but then again considering we are invited along for a ride to see how Turing invests so much time, energy and love into this machine, it would be good to have been able to understand a little more of what exactly he is doing. I don’t think it would have been beyond audiences to be given a little more complexity there. As to addressing the issues regarding Turing’s sexuality I have to praise the film for downplaying this element in many regards; it doesn’t focus upon that aspect of the man and therefore distort him, but instead seeks to remind us that who he went to bed with was only a fraction of the complete person. What the film does which I think is pretty unforgivable though is sideline the tragic nature of Turing’s punishment. Sure we get a few minutes at the end which addresses that, but the discussion of his fate is nearly as important as his work and it feels sadly underdeveloped here. Cumberbatch demonstrates such abundant skill in this film but unfortunately we can only speculate about just how high he could have soared if the film had explored the darker days in some more detail. It seems that The Imitation Game doesn’t know whether it wants to focus on the Enigma story strand, the homosexual one or indeed the tragic aftermath strand and so muddles through all three without striking deeply into any of them. Ultimately it’s not as hard hitting, nor as emotionally stirring as it should be given the terrible crime which the British Government committed against Turing and other homosexuals. There is so much to praise here in regard to the performances, but I do maintain that they are hampered by a reductive script. The opportunity to really tackle Turing and his punishment, and also to explore some of the complications behind cracking the Enigma code is sadly missed here. What is the film’s greatest strength? It has to be the committed performance given by Cumberbatch. Its greatest weakness? It’s rather clunky and surface level script. Would I see it again? I’ll give a tentative yes to this one… it’ll be interesting to see how it fares after a second watch. Thanks for reading, please do sound off in the comment box below! Think I’m spot on? Think I’m a crazy fool? Either way, I want to hear what you think! Completely agree. The plot of the film is essentially Turing wants to build a machine, Turing builds a machine, they work out how to calibrate machine, it works, the end. A visit to Bletchley Park and The National Musem Of Computing was much more insightful and interesting into how this all came to pass. Yeah it certainly isn’t too informative. Not that I want it to be overly fact heavy, but a little more insight couldn’t have hurt! Nice review! Never been a big Cumberbatch fan, but I thought he was very good in this. I’m a big Keira Knightley fan and she was great too, especially with her mannerisms. Thanks! Oh really? I have to say that I have liked him since seeing Sherlock a few years back. Yeah she sometimes doesn’t impress me to much but I thought she really brought a lot to this film and really worked hard. Excellent review! I’ll probably be watching this next week. Yeah, I’ve heard the movie isn’t as good as it should be but I look forward to Cumberbatch’s performance. And so you should – he is excellent in it! I hope you enjoy the movie, I look forward to talking with you about it! Definitely a serious contender at the Oscars this year. Can’t wait to see it. Yeah there’s no doubt that it’ll be nominated for a few categories. I’ll be interested to know what you make of it!